SINGAPORE - The Republic of Singapore Air Force (RSAF) is set to wow the crowd at the Singapore Airshow next week with 11 aerobatic stunts. 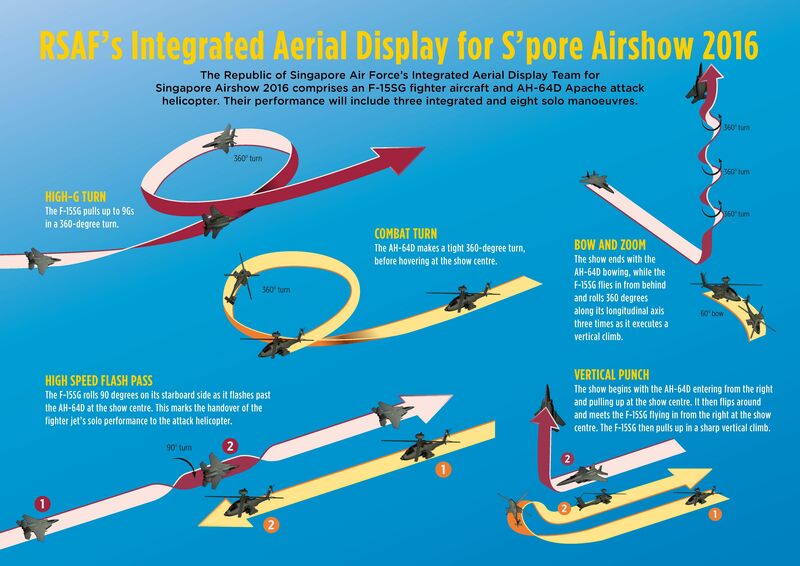 The manoeuvres will be performed by an F-15SG aircraft and an AH-64D Apache attack helicopter above the waters off the Changi Exhibition Centre. This is the first time both types of aircraft are performing together here. Each will perform four solo moves and three integrated stunts - including one called the Vertical Punch, which will involve the Apache helicopter flying a loop as the F-15 punches upward in a vertical climb. The Singapore Airshow will be held from Feb 16 to 21, with the show open to the public on the last two days. The RSAF is also putting up 11 static displays, including one of the F-16C aircraft used by the RSAF Black Knights aerobatics team last year. The team performed dare-devil stunts to mark Singapore's golden jubilee. The Black Knights are not performing at this airshow because they were stood down after SG50.